Model 1420LRB Comby feature the lavatory housing measuring a width of 20 inches (508 mm). The lavatory bowl is rectangular. The toilet can be configured to be Angle Left, Angle Right, Left Offset or Right Offset. Fixture is arranged to be installed on finished wall and serviced from an accessible pipe chase. When facing a Lav-Toilet Comby, the toilet is in the front of the cabinet and is located toward the left hand side. When facing a Lav-Toilet Comby or Modular Service Cener, the toilet is in the front of the cabinet and is located toward the right hand side. This single temperature valve is a pneumatically operated, pushbutton valve that uses atmospheric air. The pushbutton is vandal-resistant and requires less than 5 pounds to activate valve. Valve can be remotely located up to 10 feet from the actuating button and is ideally suited for small chase areas. Metering provides an adjustable timed cycle flow from the valve. Timing is adjustable from 5 to 60 seconds. Air-Control™ features non-hold open pushbutton activation, and is provided with a stainless steel strainer and an integral checkstop. Valve conforms with the lead-free requirements of NSF61, Section 9, 1997; CHSC 116875 and ADA requirements. This hot and cold valve is a pneumatically operated, hand pushbutton, soft closing valve that uses atmospheric air. The pushbutton is vandal-resistant and requires less than 5 pounds to activate valve. Valve can be remotely located up to 10 feet from the actuating button and is ideally suited for small chase areas. Valve conforms with the lead-free requirements of NSF61, Section 9, 1997; Federal Public Law 111-380 and ADA requirements. requirements of NSF61, Section 9, 1997; Federal Public Law 111-380 and ADA requirements. 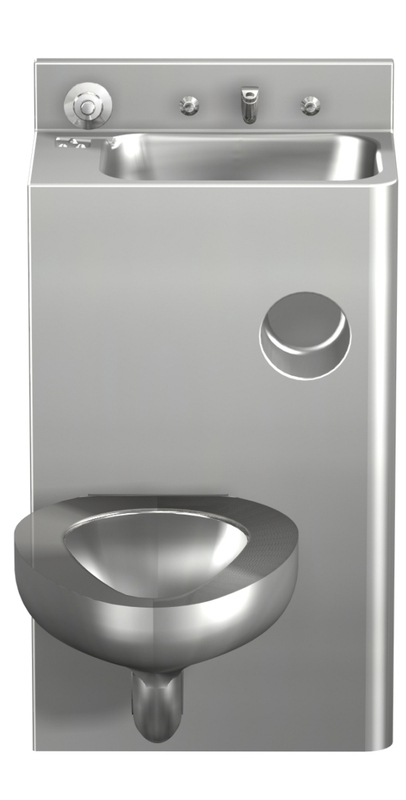 Model 1420FA Comby feature the lavatory housing measuring a width of 20 inches (508 mm). The lavatory bowl is oval. The toilet can be configured to be Angle Left, Angle Right, Left Offset or Right Offset. Fixture is arranged to be installed on finished wall and serviced from an accessible pipe chase. 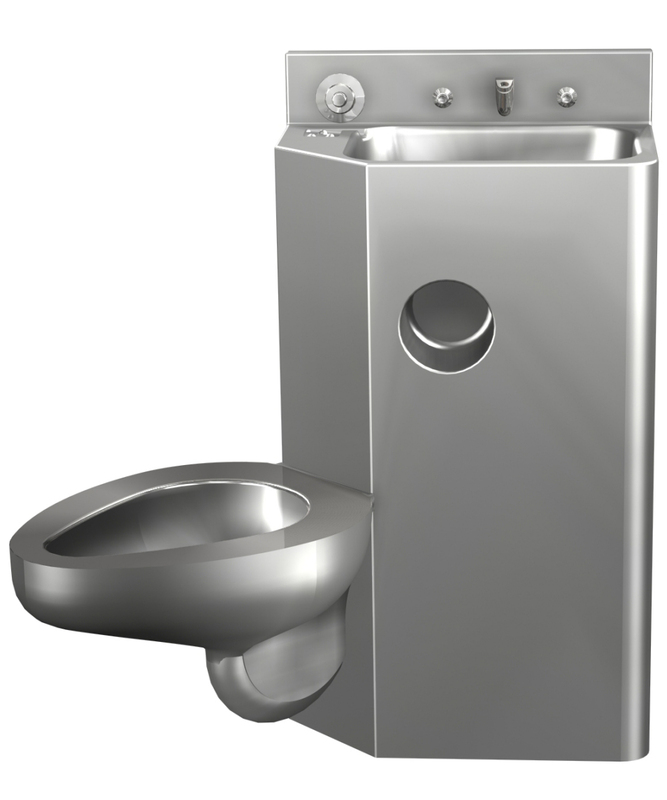 Model 1420 Comby feature the lavatory housing measuring a width of 20 inches (508 mm). The lavatory bowl is oval. The toilet can be configured to be Angle Left, Angle Right, Left Offset or Right Offset. Fixture is arranged to be installed on finished wall through access panels. Panels are located on front and side of cabinet and are secured with tamper-resistant screws.